The presentation can range in length from 15 minutes to over an hour depending on your needs. If you wish, music can be effectively incorporated into the presentation. For large groups a power point of photos from the book is presented along with the reading. Can't get to a Live Poetry Reading? 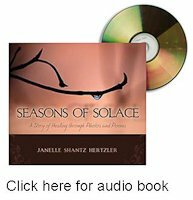 If you'd like to hear Janelle read her poetry but can't get to a live poetry reading, check out this recording. The bonus feature is a video including the photographs she uses in live presentations. Day-long or weekend retreats can also be arranged where retreatants are invited into a healing space to process their own losses and disappointments in life. Use the Contact Me form to ask about availability and further details.